Knife material is available both in stainless and SK. Screen is easy to clean as well as to change. 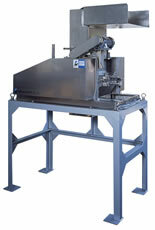 This machine structure enables easy change of material. A hopper equipped with a magnet is made - to - order to prevent magnetic substances being mixed.